Dear God, I come to you thanking you and praising your Holy name. Thank you for waking me up this morning and allowing me to see another day. Thank you for breath in my body and movement of my limbs. Thank you for a sound mind because the world will make you think you are losing your mind. So thank you for guarding my thoughts and my words. Lord, forgive me of the sins I’ve committed knowingly and unknowingly. Anything that I’m unaware of please bring it to the forefront of my mind, so I can get things right with you and with others. Help me to decrease that you may increase. Help me to seek your face and not just your hand. Lord, I sit before you in prayer lifting up everyone who is reading this today. I pray your protection over every man, woman, boy and girl. The world is filled with rage and violence and we need your protection. I pray that you place a hedge of protection around everyone’s job, schools, vehicles, neighborhoods and our churches. Lord, we need your glory. Lord, we need your guidance. Lord, saturate our minds, hearts, body and souls with your word. Lord, cause every person to submit to your will and run after your way. Lord, I pray for the children. Cause each little child to learn about you. Lord, we need you to fill our children’s life and give them hope in a gloomy world. Lord, cause every child to have a longing for something greater than what they see on T.V., in the streets, or on social media. Lord, cause parents to be accountible for their children. Cause parents to love their children as you love us. Lord, reach into the marriages of these families and cause husbands to love their wives, cause wives to love their husbands. Lord, unite families like never before. Lord, I decree and declare that the devil will not have reign or rule over families anymore. I bind divorce in the name of Jesus. I bind domestic violence in the name of Jesus. I bind murder in the name of Jesus. I bind rebellion in the name of Jesus. Lord, come into our hearts and change our way of living, thinking and being. I love you and I bless your name and count all of this done in the Mighty Name Jesus Christ, AMEN! You can’t do anything right! God reminded me, words hurt, but love does not! Domestic violence is not just physical violence. It can be emotional and mental. Don’t allow anyone to tell you they love you if they continue to beat you up with their words. LOVE DOES NOT HURT!!! Good morning! Forgive me for my absence. I had midterms, papers and a presentation to work on. Being a multi-tasking wife, mother, grad student and super woman is not easy. (Giggling) I curtsy to all of the strong women who do so much and make it look easy. God is smiling on you for your awesome time management. Let me jump right into today’s blog, as believers we have to learn to be content no matter what state we are in. Let me make it personal, “I NEED TO LEARN TO BE CONTENT NO MATTER WHAT STATE I AM IN!” Please re-read that last sentence if it applies to you. As a child of God, I should not and cannot operate like the people of this world. I’m sorry, but I have encountered too many people who profess to be a child of God, but they complain about EVERYTHING! If it’s a nice day, they complain about the sun being to bright. If it’s rainy, they complain about it being a cold rain. They are employed, but complain about EVERY aspect of their job. They say with one breath, God is good all of the time. Then in the next breath they say they don’t understand why they have to live the way they are living. Now don’t get me wrong, I have been guilty of complaining as well, but during my journey with Christ I have been able to identify when I have to stop and recognize the blessing. God is teaching me daily how to become more content. The words we speak will become our thoughts and then our actions. Our attitudes are contagious and it’s important to check the complaining at the door. When you complain about everything, you are telling God He didn’t get anything right. Is that what you really meant to say? Well what does content mean? I am glad you asked. Content is defined as desiring no more than what one has; to be satisfied. Learn to become satisfied with what God has provided you in this season. Please note, it doesn’t mean God will not bless you with more, but don’t complain about what you have in the now, learn to appreciate it. I dare you to be satisfied with your income instead of cursing the job you have. Your income may not be all that you want it to be, but remember you are currently employed and that is a blessing in itself. Learn to be content and appreciate how God has still provided for your household. I encourage you to be content with your current living situation. You may not have the house you want, but thank God for having a place to rest at night. Learn to be satisfied with the things and resources God has placed for you in this season. Think about it for a moment; if God blessed you with things now and you can’t even appreciate them, why would He bless you with more? Where is the level of humility and gratitude in what God has given you right now? I encourage you, as God encouraged me, to learn to be content no matter what state you are in. Please note, this does not mean to settle for less, it means to find value and satisfaction in the blessings given at all levels. One day God will bless you with more, but He wants to see if you can appreciate smaller things in the wilderness. I pray that God continues to guard our hearts, our tongues, our attitudes and keep us humble. 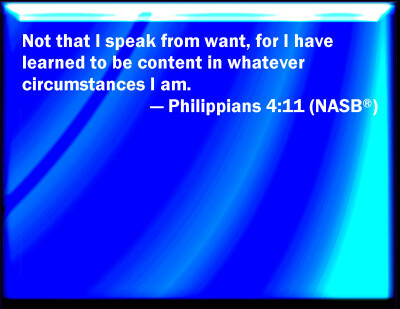 I pray that we learn to be content no matter what life looks like. I am satisfied with Christ and I want to show Him that I am grateful for everything He has given me, from the smallest of blessings to the largest blessings. How about you? Stop complaining so much. Stop comparing your life to others. Stop bashing the blessings that sit at your table. Stop cursing the doors that have been opened for you. Learn to be content! God bless. Have a wonderful weekend! Good afternoon! Happy Friday to you all! God still sits on the throne! That is enough to make me shout any day! I pray that everyone has had a blessed week and I pray that you have a wonderful weekend! This week I have been stalking this song called Pursuit by Kim Walker. If you get a moment please listen to it. It’s a powerful song of worship. It’s a passionate love song to God. This song has caused me to examine my relationship with Christ and I realize I am in pursuit of Him. When you are in pursuit of something or someone you are in a quest to secure or obtain them. I am desperately in pursuit of a deeper relationship with Christ. I want all that loving Christ entails. I’m in pursuit! I love the assurance I receive from God’s word that when I seek the Lord I will find Him. My quest for Him is not in vain. I realize daily I have to relinquish somethings and even some people in order to draw closer to Christ. I want God to take away anything that is within me that is not like Him so I don’t hinder the love relationship I seek from Him. 29 But from there you will seek the Lord your God, and you will find Him if you seek Him with all your heart and with all your soul. All I have to do is seek the Lord with ALL of my heart and soul and I will find Him. I’m in pursuit! I can rejoice in my pursuit! I am so glad that I can go through this journey with a happy heart. When I pursue God I am putting my trust in Him. And my bible tells me that God has never forsaken those who seek Him. I’m in pursuit! Are you in pursuit of God today? Are you on a quest to secure a deeper relationship with Christ? I dare you to pursue Christ with your whole heart. It’s worth it! Have a blessed day pursuing God! First step to bringing awareness to any problem is admitting there is a problem. 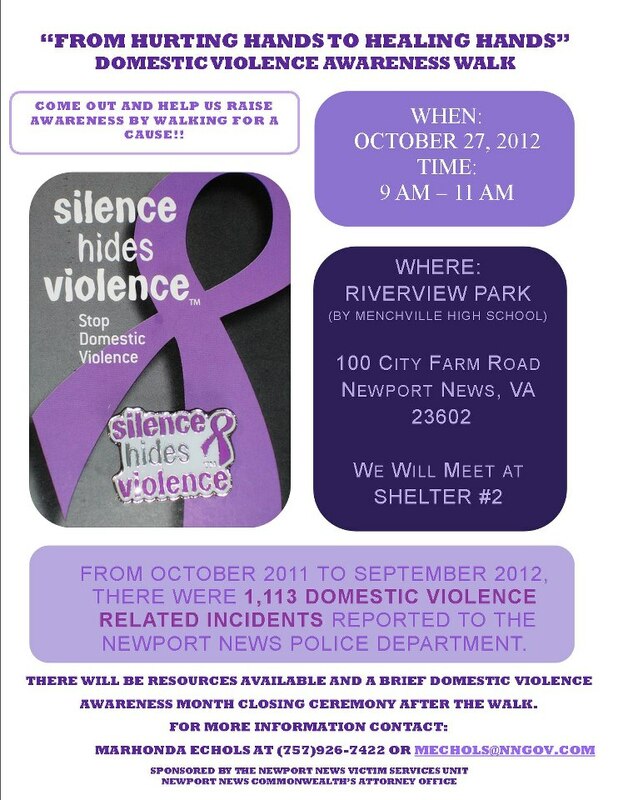 Domestic Violence is serious and it’s time to bring awareness to the community. Come out on Saturday, October 27, 2012! Choose to be a voice for the voiceless! Every year, 1 in 3 women who is a victim of homicide is murdered by her current or former partner. ~Domestic violence is a growing trend among our young people. Our youth are experiences domestic violence at an alarming rate. Domestic violence doesn’t discriminate and even Christians experience this day-to-day. As a body of believers we have to become proactive, educate ourselves and become a voice for the voiceless. I’m not telling you to go bust down doors when you hear or see signs of domestic violence, but I am encouraging you to place anonymous calls when you hear or see these things. I am telling you to educate yourself on the topic so that you can better service people who are trying to escape. I am telling you to stop judging the victim and seek ways to help the victim. I am urging the churches to create print materials and resources that can be placed in restrooms for victims. I am SHOUTING from the TOP OF MY LUNGS FOR EVERYONE WHO HAS A VOICE AND A HEART TO STOP REMAINING SILENT AND SPEAK UP AGAINST DOMESTIC VIOLENCE!!! It’s time for us to open up our mouths concerning the things that matter. You could help save a life! Every year I get a physical. The doctor weighs me, looks me over, takes some blood samples, checks my vitals and blood pressure and all of this is done to make sure I am in good health. It’s important to get a yearly examination because we can’t just assume that everything is okay. We need to be examined in order to receive confirmation that everything is well. The same is true for our spiritual body. It’s important to examine ourselves. “Why should I examine myself? I know I am saved.” Is a statement you may quote to yourself. I dare you to examine yourself against God’s word. I dare you to examine your walk against the instructions of the Lord. When was the last time you had a spiritual examination? When was the last time you allowed God to look you over, check your vitals, take your blood pressure, check your heart condition, check your ability to forgive, examine your prayer life, or test out your devotional life? Now you don’t have to give me an answer, but you should be true to yourself and answer this question honestly. When I read this scripture, I had to stop and say when was the last time I received a spiritual examination? How often do I receive a spiritual physical that will test my faith to make sure that I’m spiritually healthy? As a believer, a wife, mother, employee, graduate student, ministry leader, author, encourager and more, my schedule can become full and hectic and there are periods of time when I need to stop and examine my life. I do not have to examine my salvation because once I accepted Christ, He gave me the assurance that I am saved for all eternity. However, I do need to examine my walk to make sure it lines up with my profession of salvation. Sometimes I fall short and miss the mark, but because I examine myself I can see my errors and correct them according to God’s word. So I challenge you and encourage you to examine yourself. The same way you get a physical examination, you need to get a spiritual examination. Don’t wait so long until things are a mess and you need spiritual surgery to repair the damage that you have done. Get periodic check-ups that allow you to be proactive and combat bad habits and a weakened faith. Each year, women experience about 4.8 million intimate partner related physical assaults and rapes. Men are the victims of about 2.9 million intimate partner related physical assaults. (Tjaden and Thoennes 2000). Intimate partner abuse resulted in 2,340 deaths in 2007. Of these deaths, 70% were females and 30% were males. (Bureau of Justice Statistics 2011). Here is a poem submitted by an awesome poet and a good friend. Every time he blows his fuse! Domestic violence is preventable-we have to refuse to remain silent and become the voice for the women, men, and children who deal with this every day. SPEAK UP, you could help save someone’s life! Did you know the month of October is National Breast Cancer awareness and Domestic Violence Awareness month? If you didn’t know, now you know. I will be wearing pink and purple ribbons throughout the month to raise awareness and bring in support to these causes. Many people know about Breast Cancer awareness, so this month I will dedicate my blogs to poems and facts on domestic violence awareness. Domestic violence is a subject matter that has crept its way into our churches, communities, and families and the time has come that we blow the whistle on it. It’s time to be a voice to the voiceless. What will you do to help a cause or raise awareness on these topics? I will be racing for cure on October 13, 2012 (Susan G. Komen) and running to raise awareness on Domestic Violence on October 27, 2012 (From Hurting Hands to Healing Hands-Lend a Hand to Help End Domestic Violence). If you are interested in participating in these events feel free to send me a message at niklellis@live.com. What will you do to help raise awareness? Remember cancer doesn’t discriminate and we can support the agencies who are fighting for a cure. Domestic violence doesn’t discriminate and we can help raise awareness by educating ourselves and by sharing what we learn with others. Join me in raising awareness.